We spent the months of January, February and March strolling the first Christmas In July Art Gallery! Since the CIJ team is worldwide we held a virtual #CIJArtGallery right here on our blog! The CIJ Art Gallery opened on Wednesday – January 28th, 2015 and closed on Tuesday – March 31st. As I mentioned the team is international and we featured artists from many countries! We wanted to include as many of our talented team members as possible! The participation was fantastic! Our team members are creative artists! Each artist shared with us their art, as well as a little bit about themselves. Please join me as we close our CIJ Art Gallery! Watch for new opportunities in the future! 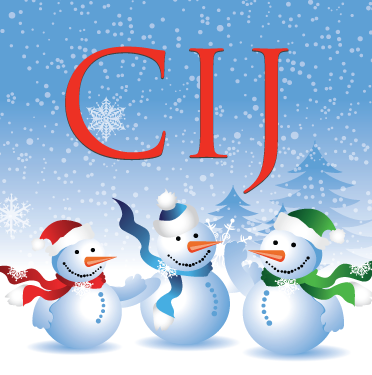 A special thank you to the blog contributors who were the hosts of the CIJ Art Gallery! Please use #CIJArtGallery on social media as you visit our virtual art gallery! Thank you so much for joining us on our #CIJArtGallery! Spring arrives this month and with the new season comes many new arrivals from members of the Christmas In July team. Hi, I’m new here to Etsy and this Team. My name is Rebecca, and I started making masks about 2 months ago out of household scraps. This one was designed for St. Patrick’s Day and I chose this design and these colors because they were my Dad’s favorite colors, and he is deceased. Thank you. In Estonia this winter has been very warm. We had some snow, but now it is gone. And some spring flowers are already flowering. So there is a little spring in the air already. And this set of earrings and necklace is also a little spring like with it´s pale green color palette. I was at a Christmas show and a wonderful woman came up to me and asked me if I could make six infinity bracelets for her daughter’s bridesmaids. I chose 12 gauge sterling silver wire and started to work on it. This is the result. I lightly hammered the bracelet so that it really reflects the light. I also plan to offer add ons with it like a hammered fine silver heart and/or an initial charm. Right now I am happy with it as is. I am drawn to simple designs and this bracelet fits with my aesthetic. Since almost the first day of my voyage in creating digital products, I’ve liked colorful things and especially patterns such as swirls and squares. I’m not a huge fan of chevron, I will admit it. These swirls and squares papers remind me of all things spring and Easter, and with all the super frigid cold we have had in Ohio and all the snow, I am definitely ready for spring. The pastel colors in this pack of papers make them good for almost any occasion including spring, Easter, new baby, get well cards, and more. Check out my shop for similar items! A landscape designed by Serina Huang, painted by me. It’s a small collage, 3×3 inches on a canvas board and is designed to fit nicely on a desk, shelf, or any kind of niche. It comes with its own little easel too. I am owned by 2 cats, Junior and Maggie, and so my shop does feature the occasional cat themed item. The cat on this piece (a reproduction of Victorian scrap) resembles Junior and since Junior is king of the house he wears a crown to befit that status. Junior is not just content with his fame in my building (he’s a rescue from the street, has been in my life for 7 years, and is very very friendly) but he wants someone to do a reality show about his life. I’m afraid the show would be quite boring as he sleeps much of the day, but he doesn’t believe me and says lots goes on when I’m not there or when I’m sleeping. It’s pink because I love pink. The items are quite basic, a button, scrap, and a fabric rose. I made it because A. I love cats; B. cat items sell in my shop; C. I love cats. By the way, the paper background is imported Indian paper I got from a local art shop. I opened my shop last summer to help pay for my new barn. We’re downsizing and my loss is your gain. These 2 items need a loving home they came off the family barn when we had to tear it down due to sagging roof and age. This is the first product I have listed in my store with this particular glaze. I don’t know why because I actually LOVE this glaze! This cup is wheelthrown and fired to stoneware temperature making it oven, dishwasher and microwave safe. Being stoneware it also has great thermal properties to keep your tea, coffee, coup or hot chocolate warm. The matching spoon rest/tea bag holder can also double as a lid if you need to leave your hot beverage – making it great for the workplace. I have other colours in my store, so feel free to convo me if you would prefer a different finish.